The square root of this number multiplied by 100 gives you the volatility index. This formula is a discrete version of the formula for "fair" strike of variance swap: While this formula may look complicated it is actually really simple if viewed in a chart. Below are 3 charts that will illustrate step by step what the formula means, and I hope will provide intuitive understanding behind the formula. For the charts below I used simulated prices of calls and puts on a hypothetical stock with 36 days until expiration (tenth of a year) and 20% annualized volatility, so we should expect the volatility index in this theoretical example to be about 20. 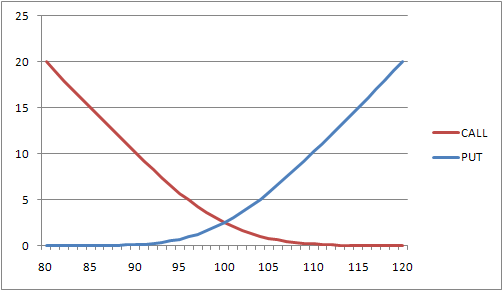 I plot prices of calls and puts vs strike. As expected puts increase with strike, and calls decline. The point at which they intersect is the forward price. Now let's consider the area below the two curves. The higher the volatility the higher are options prices, the greater the area under curves. Now the last step - multiply each value by 2*exp(r*T) and divide by T*K^2 . The adjusted curve will have almost the same shape, but will be different in height. So meaning of the curve does not change, just the scale - the higher the volatility, the greater the area under the curve. The area under the curve is sigma squared in the first equation. In my calculations the area is 0.040157. The square root of the number multiplied by 100 is 20.0392 which is very close to 20 as we expected. 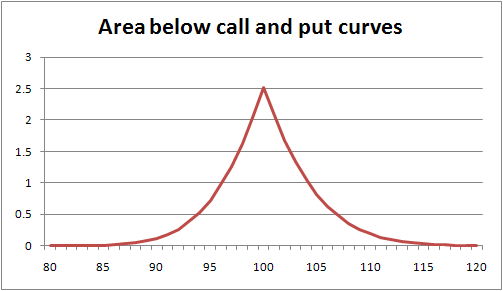 To summarize - VIX is approximately proportional to the area under call and put curves. Another property of volatility indexes is becomes apparent - ATM, or near ATM options have the greatest contribution to its value. This post is based on ideas from Simple Variance Swaps by Ian Martin (available here). Hi, below your first figure you state "The point at which they intersect is the forward price." Is this supposed to be the market price of a forward/future on the VIX? Could you elaborate? No, forward on the underlying. very insightful explanation, thank you ! Could you provide a little insight as well into the discretization of the formula. What is the intuition behind - 1/T(F/K_0-1)^2? Is this some correction term for double counting something in the summation? I have not worked through the formulas, so cannot say for sure, but from what I see you are correct - it is the adjustment term for difference between strike closest to the forward (K_0 in the formula) and actual forward price. hi how come i can't see the graphs in this blog. Thank you very much, Anonymous. I was able to fix all but one, imageshack is not cooperating at the moment. Please let me know if anything else is not working properly.